When I first met Spaceship Betty she was on the phone. Specifically, on the back of a smart phone owned by creator and alter-ego Lynnda Rakos. She was adorable. I wanted one, and I don’t even have a smart phone. With her huge space helmet coupled with a flippy a-line dress and ballet shoes, she hearkens back to a more innocent age, which is a large part of her appeal. 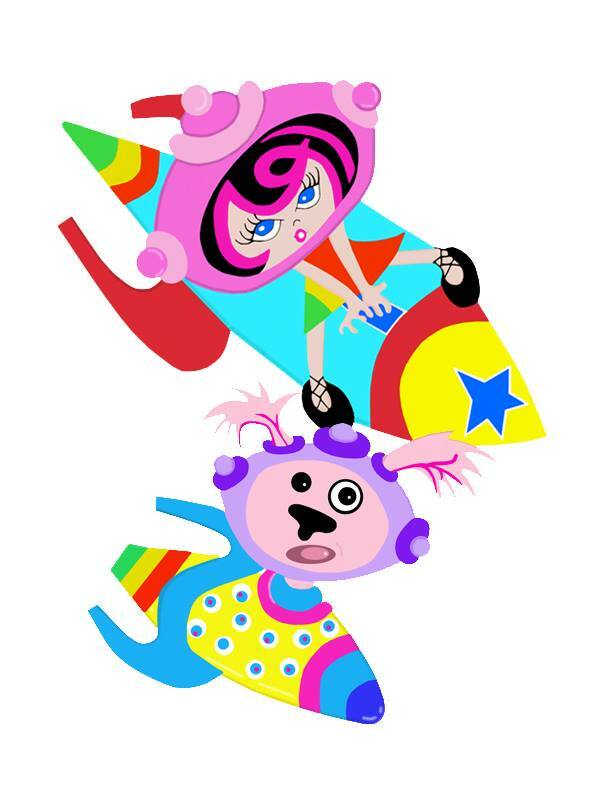 Plus, Spaceship Betty and her dog Bubblegum zip around the universe on their own rocket ships. Think Jetsons meet Dora the Explorer. So when Lynnda asked me if I would help take Betty 3D, I was excited. I was going to have a papier-mâché playmate and, at least from the standpoint of a sculptor, Spaceship Betty was going to get real. Phase 1: We rummaged around the garage for things to make the armature and came up with the usual suspects…a broken chair leg, newspaper, wire, duct tape, a ball. Lynnda was skeptical. Understandably. The skeleton version of Betty looked like an alien, and not the friendly kind. Betty’s mother wanted to cry. I reassured her and then stuck her hands in paste. It was warm and that made her feel better. Phases 2-10: Getting the football-shaped head right posed a problem. Betty underwent several brain surgeries. Fortunately, I don’t think she remembers. Being quite top-heavy, she needed a good base to stand on…a hat box with some Quickcrete did the trick. After the paste and paper phase was done, Spaceship Betty went home with mom. Phases 10-25: As far as I’m concerned, this part happened off-line. 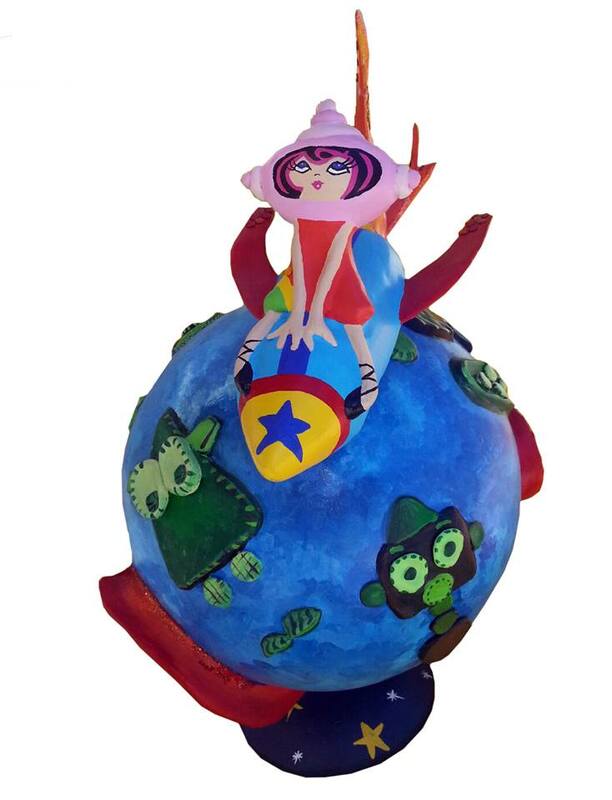 When Spaceship Betty went home, she whole but in rough shape. After many rounds of patching and sanding and patching and sanding; then painting and finishing. 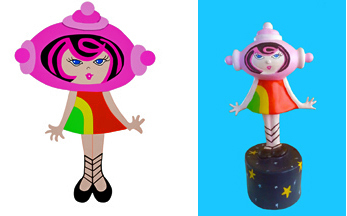 Lynnda unveiled Spaceship Betty 3D. My jaw dropped. She’s a stunner. 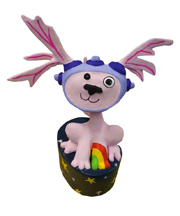 Next to follow was Bubblegum, Spaceship Betty’s aptly named dog and trusty sidekick. This time we wised up and Lynnda brought a dog-toy football for Bubblegum’s head to Phase 1. During Phases 2-10, Lynnda bemoaned that Bubblegum resembled a lizard on a stick, a phenomenon she saw in Mexico. But when Lynnda took Bubblegum home and did her magic in Phases 10-25, Bubblegum emerged as cute as a button. In the next project, Spaceship Betty goes on her first adventure. See her streaking across the surface of a strange and wonderful robot planet in her spaceship. Look closely and you can see that the continents are robot-shaped land masses emerging from moody blue oceans. I can’t wait to see the animated version of the story! She has her own Facebook Fan Page. Be sure to Like her. Next week Spaceship Betty’s very own song “Extraordinary Girl” will be recorded in the studio by musician song-writer David Harvey with David Burke (host and creator of animated TV show “Hey Wordy”) and musician Jay Goeppner. You’ll be able to see it on YouTube when it is done. Coloring books are in the works. There is some buzz around an animated TV series or even a movie. I’ve got my 3D goggles ready.